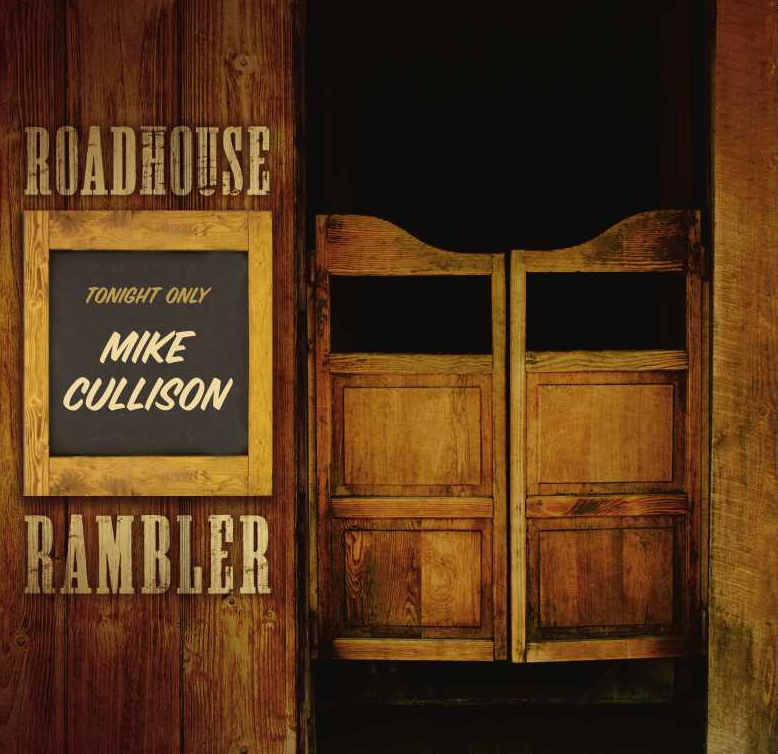 Mike Cullison and Band • "Roadhouse Rambler"
• Winner (out of 500+ submissions) for inclusion inThe Alternate Root's "Songs for Social Change" Competition -- joining James McMurtry, Jason & the Scorchers, and 23 more. • Chosen for the "Take a Trip on 66" CD Vol. 1 by Project Route 66 - a nonprofit effort to restore what is left of Route 66. The story of Mike Cullison and his music brings to mind a sculptor named J. Seward Johnson Jr. who turns famous Impressionist paintings into life-sized, three-dimensional tableaux, incorporating not only the original images, but his own fanciful imaginings of what went on beyond the canvas. 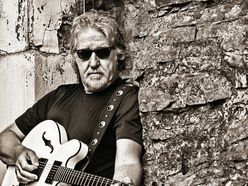 Oklahoma native Cullison, who’s honed his songwriting skills with such royalty as Don Goodman (“Ol’ Red”), Johnny Neel (the Allman Brothers) and Mike Stergis (Crosby, Stills & Nash), describes his style as “roadhouse blues and country roots-rock.” But his influences are as vast as the early rock ‘n’ roll his mom adored and the classic country his dad preferred, and he draws deeply from that well, along with other Americana styles — from Bakersfield to hybrid zyde-Cajun blues — to create a rich aural tapestry as colorful as Johnson’s art. 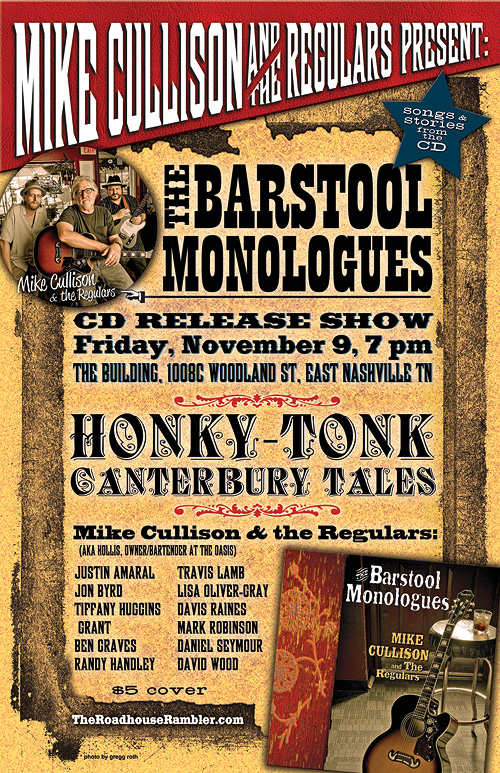 Each song is introduced with a short track from Hollis (Mike Cullison), the bartender-proprietor of The Oasis. *The artist (“Regular”) who performs the song. Mike with his band (Mark Robinson on guitar, Jon Radford on drums, and Kenny Owens on bass) performing live at Billy Block's Sunday radio show from the legendary Tootsie's Honky Tonk on Lower Broadway, Nashville. 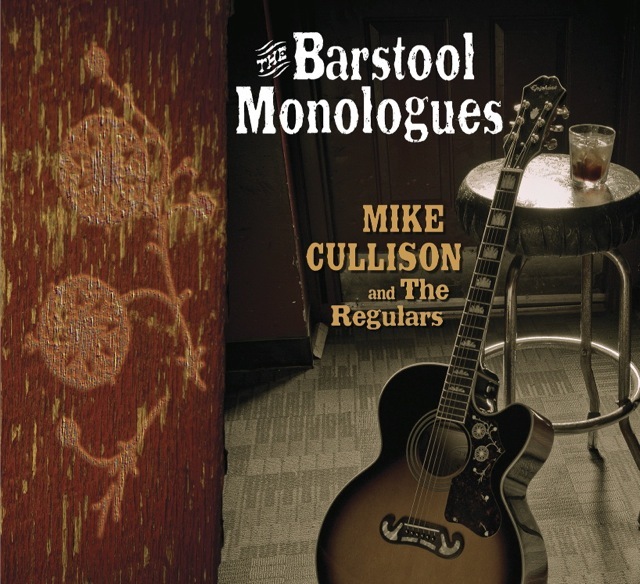 Mike Cullison was born in Shawnee, Oklahoma. He attended Robert E. Lee Grade School and Shawnee Junior. High before moving to Midwest City, graduating from high school there in 1968. Today his brother Andy lives in Oklahoma City, he has many relatives still around the Shawnee area. Mike is a member of the First Families Twin Territories--his grandparents settled in Oklahoma before statehood. From the Oklahoma-Texas area to Atlanta to Nashville and stints in Europe, Mike's musical journey has been an extraordinary one. 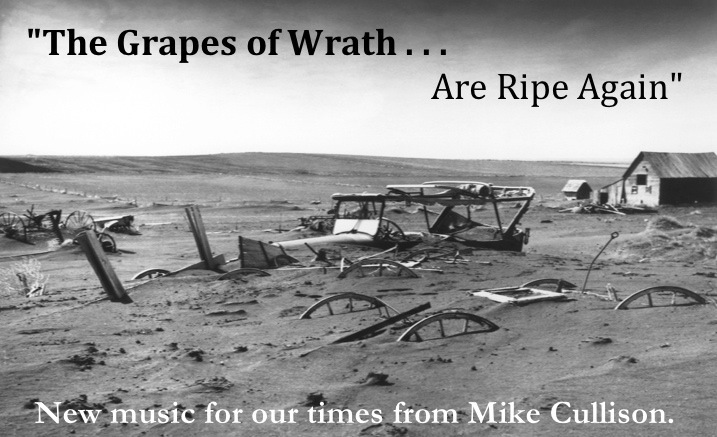 Mike’s innate writing skills and love of music merged early on. He grew up on Country & Western and Honky Tonk, then moved into a diverse blend of music as a young man in the '60s. Some of his many influences are The Beatles, Hank Williams, Bob Dylan, Jimmy Buffett, Delbert McClinton, and all the great story-tellers of years gone by.